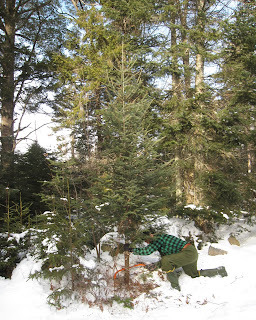 Like the Ruralpolitans we are, our Adirondack Christmas traditions naturally include harvesting our own Christmas tree, usually from the homestead acreage. Here we have Ed, the resident biologist and ruralpolitan woodsman, reveling in his independence and self-sufficiency while harvesting this year's tree. Stayed tuned for more authentically Adirondack ruralpolitan Christmas traditions!